Mayor says at least R27.5 million has been allocated for the repairs of five sinkholes for the 2017/2018 financial year. 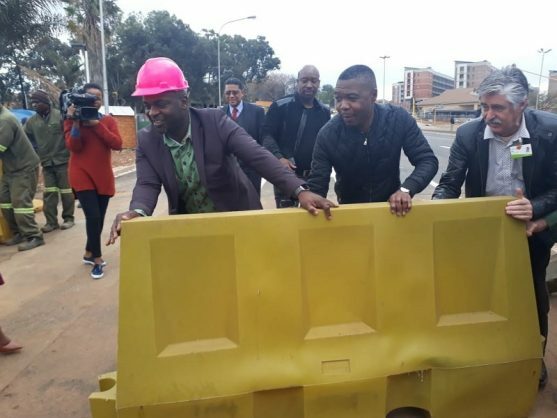 Tshwane Mayor Solly Msimanga and his mayoral committee member for roads and transport, Sheila Lynn Senkubuge, partially opened a road on Jean Avenue and Gerhard Street in Centurion, Pretoria after it was affected by a sinkhole. “The flow of traffic on Gerhard Street will be improved after partially opening both North and South directions where vehicles will be able to turn from Gerhard Street into Jean Avenue in an Eastern direction only,” Msimanga said. Vehicles are still unable to turn into Jean Avenue in a Western direction from Gerhard Street, as that portion of the road will be closed in order to repair the second sinkhole, which is currently underway. Msimanga said that this is the largest single cost of repair, amounting to R25 million. He said at least R27.5 million had been allocated for the repairs of five of the highest ranked sinkholes for the 2017/2018 financial year. “In the current financial year R25 million will be made available in the current financial year for the rehabilitation of other sinkholes,” Msimanga said. Senkubuge said the site was handed over to a specialised contractor in January. She said repairing the sinkhole was a complicated science that needed experts who had to not only fill the sinkhole but do it in a way that tried to prevent it from growing in the future. “It is important to note that sinkholes can occur naturally over time, but are aggravated in built-up areas due to leakage and ingress of stormwater, water or wastewater into the subsurface, and also through the lowering of the groundwater table through dewatering,” Senkubuge said.